If you make anything this weekend, you must make these Raspberry Almond Thumbprint Cookies. If you have been following my blog for awhile, you know I love adding almond extract to anything I can. I can seriously smell it all day. In fact, my favorite lotion has the same scent. Heavenly! On Pinterest the other day, I came across a recipe for raspberry almond thumbprints. I didn’t actually click on the pin, but I did make a mental note to create a recipe for Raspberry Almond Thumbprint Cookies. They came out delicious! If you like all things almond flavored, you make also like my flourless almond joy blondies or my almond joy protein bars. One can never have too many healthy cookie recipes right? 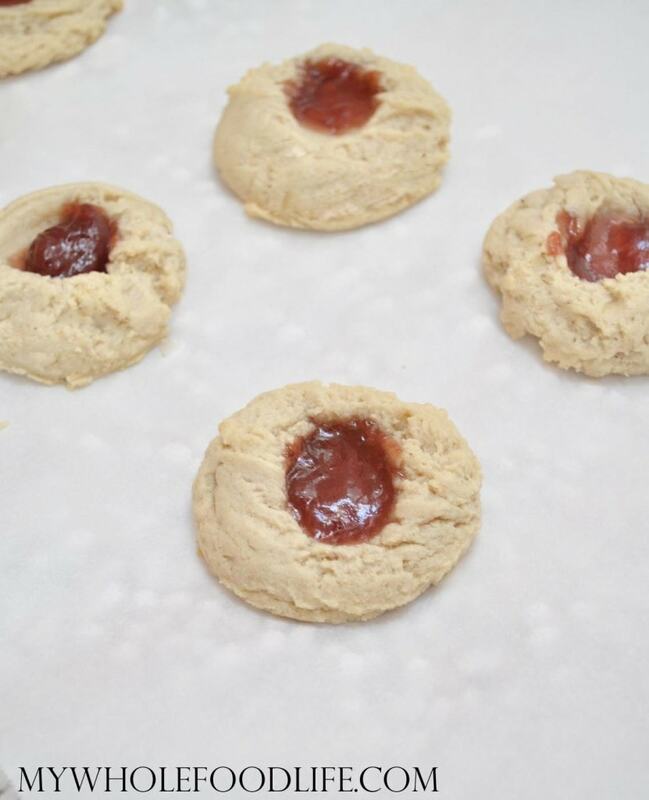 These raspberry almond thumbprint cookies are vegan, gluten free and paleo. All you need is 5 simple ingredients! I made my own cashew butter to use in this recipe. It’s super easy. Just throw cashews in a food processor and blend. This recipe makes a small batch too, so you will not be stuck with a huge amount of cookies. All you need is 5 simple ingredients to make these healthy, flourless cookies! In a food processor , combine all ingredients, except the jam. Mix until smooth. Using your thumb, press down into each cookie. Spoon a bit of jam into each "thumbprint." Let the cookies cool completely before moving them off the baking sheet. They will crumble if touched too soon. Store cookies in an airtight container. They should last a couple weeks. You can also freeze them for longer storage. Enjoy! Do you think could sub another type of nut butter? How many cups of nuts did it take to make your own? You can. It took about 2 cups of cashews to make the nut butter for this. Oh these remind me of my childhood! I loved to make these with my mom in the kitchen! I would always be responsible for filling the thumbprint with jelly! Great memories, these are one of my fav. cookies! I'm sorry, I don't know it. I bet you can plug the recipe into My Fitness Pal for a rough estimate. Made these yesterday. Forced me to make cashew butter for the first time. Two thumbs up. Will make these again! A plus-they are so rich I won't gobble the whole batch up. Taste good frozen! Yay!! Glad you liked them Elaine. I wonder how it would taste with almond butter? Thoughts? A friend gave me a BOATLOAD of free jars of almond butter. Would it work instead? Lucky you!! Yes it should work too. Anything with raspberries is a win for me. Nice! You should try adding a tiny bit of almond extract to chocolate ice cream. It's amazing. Why are these cookies called Raspberry Almond Thumbprint Cookies? You have no Raspberries nor almonds in the recipe!!!!!!!! I finally made these and I added poppyseeds too because I have a favorite unhealthy thumbprint cookie that includes them. I used raspberry chia jam and they are so good!!! Thank you so much for this healthy version of my old favorite! You are so welcome Anna! Glad you liked them!